Today we have a guest post from one of my good friends (and a fan of good restaurants) Kailash Desai. 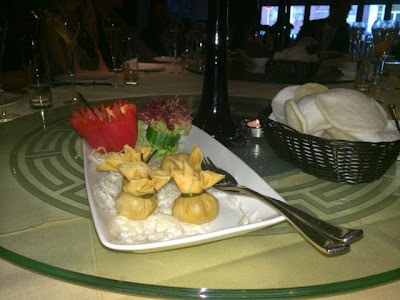 We were invited to the launch of the new Spring menu of Henry Wongs restaurant in Harborne near Birmingham with promise of a tasting menu full of exotic delights. The evening was also a chance to sample some champagnes that were provided with the courses. Having not visited Henry Wong in some years, I can truly state that the standards of service and food are still excellent. Even some of the same staff members were still there! 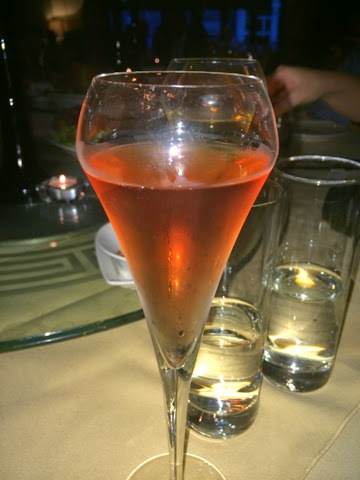 Laurent-Perrier Ultra Brut - This champagne complimented the following dishes very well. Next we had soft shell crab with chilli and garlic. One of my favourite dishes of the evening and I would highly recommend it to try. 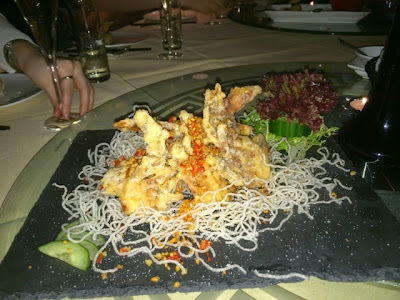 The tempura batter wrapped around the soft shell crab was amazing. It was snatched up quickly by other guests. The champagne choice to accompany this delicate dish was a perfect match! 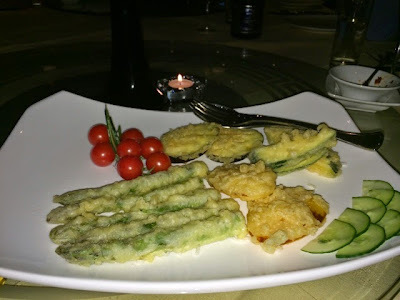 Mixed Vegetable Tempura. I've had similar dishes in other restaurants and again this dish did not dissapoint. However, I have never had a Aubergine in tempura before. If you're like me and you're not a big fan of Aubergine, I would still recommend this dish. The Aubergine was cooked perfectly and I enjoyed eating this delivered with a firm, cooked crispy texture. 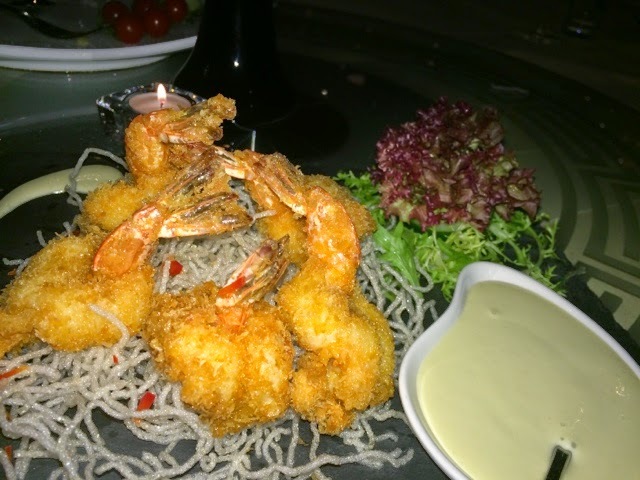 Butterfly King Prawn with Wasabi Sauce Dip. The breadcrumb coating covering the king prawn was a joy to eat. 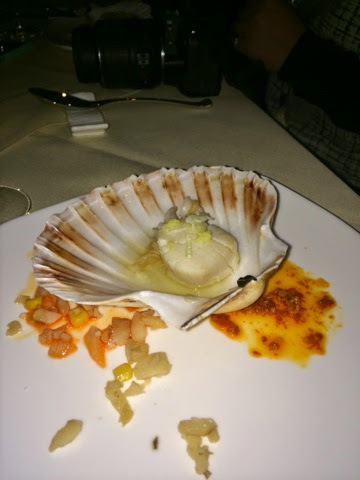 But the star of this dish was the Wasabi. Great combination! The starters were followed with a refreshing elderflower and pear sorbet. Next we moved on to the main courses - firstly Aromatic Duck with Pancakes. The best tasting crispy duck I have ever had and the Laurent-Perrier Rose was perfectly match to this dish and was my favourite champagne of the evening. Wow!! What a match, and the sauce did not have a bitter aftertaste which I experienced before. The honey peppered chicken (back of picture) was nice and crispy and if you love chicken dishes, this dish will not dissapoint. 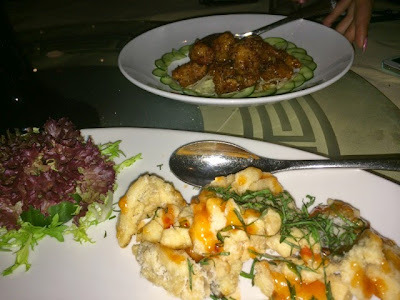 I liked the sweet and sour sea bass but it wasn't my favourite dish as I not a big fan of fish; for those fish lovers, I am sure you'll enjoy this fresh crispy dish. 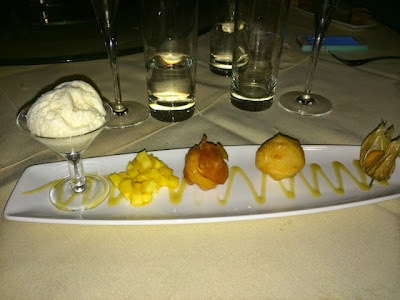 The Mango & Lychee Fritters starved with a scoop of Vanilla ice cream was a nice dessert to end the evening. I have a sweet tooth and this delivered a fruity, fun end to the evening while still being light enough for everyone to manage after all those courses! Steam Scollop with Spicy Soya Sauce, Ginger and Spring Onion. 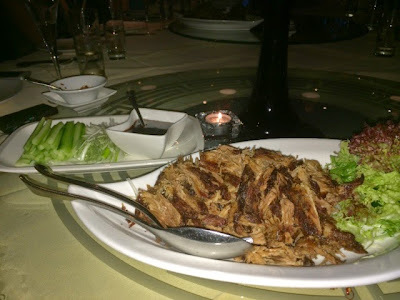 Unfortunately, not my favourite, it lacked flavour, I think the spicy soya sauce may have been missing from ours, as when looking at the other guest's dishes, the had the sauce in their dish. The Champagne; Laurent-Perrier NV Brut French 75 Cocktail with Gin and Lemon juice and the Laurent-Perrier NV Brut with Brandy, Star Anise and Brown Sugar was a mouth watering refreshing cocktail. 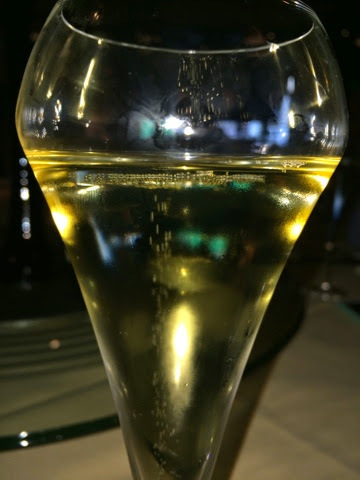 The light aerated bubbles flowing up within the champagne is excellent comparred to other champagne leaders. The choice of champagne accompanying the dishes was enlightening for my unrefined taste pallet, although it's something I could definitely get used to! Despite my initial reservations champagne does compliment Cantonese dishes well, and the lightness and depth of flavours do not clash. The were other dishes I would recommend that I did not get chance to picture, these are the Char Siu Cantonese Roast Pork, Rack of Lamb finished with a lightly stir friend seasoning of herbs, accompanied with Singapore noodles and Shanghai Freid Rice with Pak Choy & Mushrooms. The atmosphere was nice and relaxing, accompanied by a singer in the background, this is rare! I will definitely not leave it so long before visiting Henry Wongs again.